For the last two iCloud restores, I see all my apps in the right place with the greyed out progress bars. The problem is that each app would download, install, then vanish. I had to redownload all apps that I wanted and rearrange them, ouch. When I had to get my iPhone 5 replaced for a faulty top lock button, the same thing happened. The fix I found was a language change after the phone restores your settings and before it starts downloading your apps. Basically a language change forces the springboard, e.g. your desktop of iPhone, to restart and fixes the problem. You can’t do it initially because as soon as your settings are restored you language prep comes with it. So it’s a matter of timing it after your preferences are restored and before you apps are downloaded. I want to apologize for not being able to recover the article I found about the fix. It was good and I want to pay tribute, once I can find it again. Saved me a bunch of time. Lesson: Changing the language of your phone and forgetting about it will warrant a crazy Siri experience and a Siri who doesn’t quite understand you. English (UK) Siri is a Brit dude. English (AUS) is regular Siri with an Aussie accent. Good Times! This entry was posted on Thursday, November 22nd, 2012 at 12:22 am and is filed under Blog. You can follow any responses to this entry through the RSS 2.0 feed. You can leave a response, or trackback from your own site. Encountered the “Music Not Working” bug in iOS 5 Beta 7 after installing as an update over-the-air (OTA). The iPod app would start skipping songs like they were lost, usually they appear greyed out but not now. They act like lost files without a promo, skipping to the next song. A day late i found this fix. So I tried to restore from iCloud backup (this is the only way i know) ‘erase all content and settings’ and restore from iCloud on reboot. I started using the iCloud backup with Beta 5. It restored settings, then the apps started downloading, got about half way then froze mid install on the ‘weber grill’ app, after a couple hours and wifi network change it reverted to “waiting”. About half my apps had installed and the rest were just ‘waiting’. iCloud settings said it was still restoring but waiting most of the day nothing else came down, “just waiting”. Installing an update, the app to update turned grey (pending new icon) and just hung there. I tried downloading a new app, that hung too. I tried deleting the an app in waiting, as if some sort of roadblock. System hung, borked restart screen. Soft reset fixed it back to half apps “waiting”. Tonight I’d had enough: I backed up my new photos, then I stopped the restore from iCloud. Everything stayed the way it was, still “waiting”. Then I turned off iCloud backup, did a quick iTunes backup (just in case), and then a full sync with iTunes. 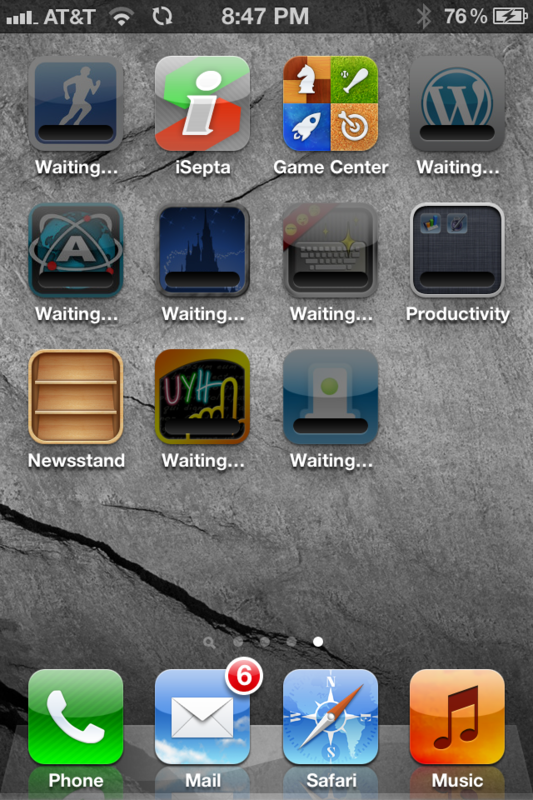 Took a bit but it picked up installing the ‘waiting’ apps, and now I’m back up and running. Just need to sit through a full iTunes music sync, maybe it will work right and do it via wifi tonight while charging, we’ll see. Love iCloud backup, but might wait until they have it live (and I have more storage being a legacy MobileMe user). This entry was posted on Friday, September 2nd, 2011 at 9:16 pm and is filed under Blog. You can follow any responses to this entry through the RSS 2.0 feed. You can leave a response, or trackback from your own site.